Ouch! Your ab workout shouldn't hurt. Experiencing back pain while doing crunches could be a precursor to a serious injury. Physiologists, personal trainers and physical therapists are quickly moving away from the traditional crunch as an ab exercise, as there's a strong association between the move and back problems such as herniated discs. Look to stationary exercises like the plank for a safer way to strengthen your abs and protect your spine from injury. Steve McGill, professor of spine biomechanics at the University of Waterloo, has been studying the negative effects of crunches on spine mechanics for more than 30 years. His lab details the compressive effect a crunch as on the spine. According to McGill in an issue of The Toronto Star, these exercises can cause hundreds of pounds of compression on the discs of your spine, and the repeated bending of the spine typical of a series of crunches can cause long-term damage. As the discs compress, they bulge outward, pressing on the nerves of your spine and causing back pain. In serious cases, a herniated disc can occur, a painful and debilitating spinal injury. Back pain that persists over several days or weeks can indicate a serious injury, such as a hernia. Always seek advice from your doctor to ensure you're not exacerbating a previous injury with any exercise, and give plenty of time to recover from back pain before attempting the exercises in this article. The crunch has been a mainstay of ab workouts for years, but the exercise may be on its way out, as a disproportionately large number of injuries can be sourced back to these exercises. In a 2005 study published in the journal Military Medicine, 56 percent of injuries in the physical readiness test of 1,500 U.S. Army soldiers resulted from crunches. It's better to stick to exercises that mimic natural motions like pushing, pulling, dragging or lifting as an alternative to the crunch. There are several exercises that provide all the abdominal strengthening benefits of a crunch, without the associated back pain. McGill developed an alternative to the traditional crunch called a modified curl-up. To do a curl-up, place your hands underneath your lower back for support, with your shoulders barely leaving the floor with each repetition. Don't flatten your back into the ground, says McGill, as this causes the compression associated with back pain. When performing McGill's modified crunch, using a yoga mat can help eliminate even more pressure from your lower back, decreasing pain. Lots of ab exercises make use of stationary positions and held poses to engage the muscles of your core. These exercises, such as the front plank, side plank and hip-thrust, are based on more natural body positions that won't cause back pain, making them an ideal replacement for a crunch. 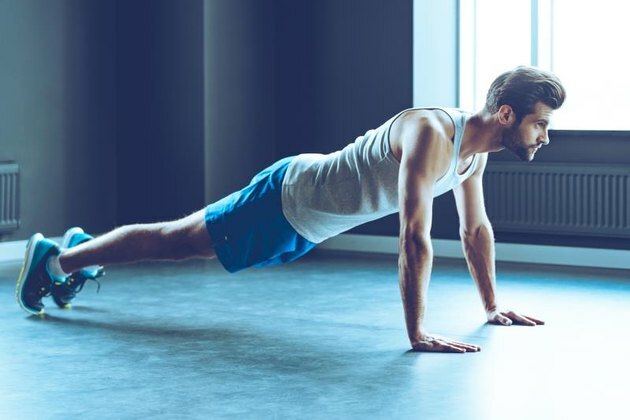 McGill notes that a plank is a far safer alternative exercise, and a routine of similarly held positions may even net better results than crunches alone, by engaging more of your core muscles and improving your balance and flexibility over time. The New York Times: Are Crunches Worth The Effort?